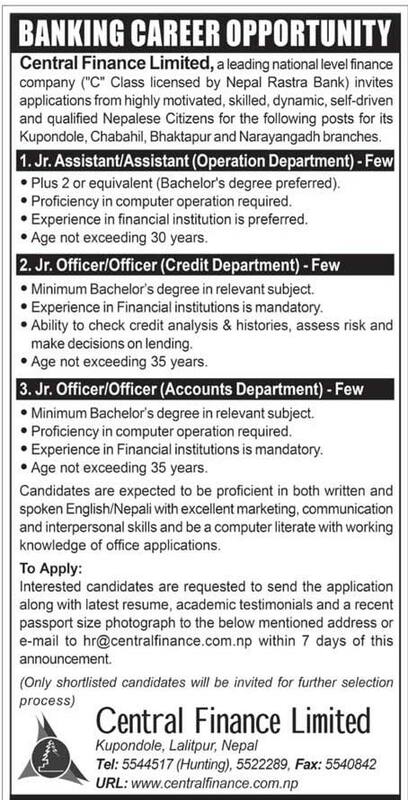 Central Finance Limited, a leading national level finance company (“C” Class licensed by Nepal Rastra Bank) invites applications from highly motivated, skilled, dynamic, self-driven and qualified Nepalese Citizens for the following posts for its Kupondole, Chabahil, Bhaktapur and Narayangadh branches. > Plus 2 or equivalent (Bachelor’s degree preferred). > Proficiency in computer operation required. > Experience in financial institution is preferred. > Minimum Bachelor’s degree in relevant subject. > Experience in Financial institutions is mandatory. > Ability to check credit analysis & histories, assess risk and make decisions on lending. Candidates are expected to be proficient in both written and spoken English/Nepali with excellent marketing, communication and interpersonal skills and be a computer literate with working knowledge of office applications.